I can't actually believe I'm sharing some indoor activities I've been doing with the kids over summer but the weather has been rubbish! So I've had to keep them inside somedays. I thought id share a couple of things the kids enjoy doing some of these things keep them occupied for ages! Violet loves her Melissa & Doug threading beads she's had them ages but still she continues to enjoy them making necklaces, some have numbers so she threads them in order count in each one. 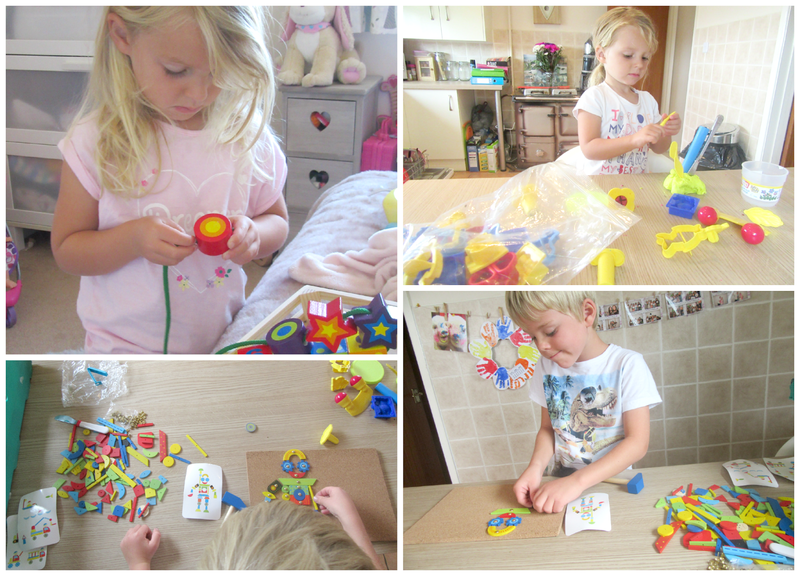 Both kids love Playdoh hours of fun building and creating we have a few different sets so they can pretend they are at a ice cream parlour or Jewellery making. Playdoh is a winner for whatever age! Alister loves the TAP TAP ART which is basically a cork board, wooden shapes and pins, and you just hammer them into the board making different types of shapes. Alisters favourite are robots and cars usually! A lot of the time Violets dolls house is packed away just because its so big and takes up a lot of space, its really nice for her to get it out though on days were staying in, she likes to include other bits in with it to such as Playmobil princess take along birthday again hours of fun. 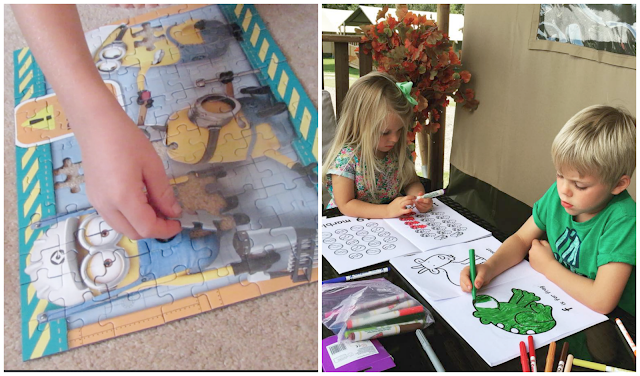 Lastly you definitely can't beat pulling out puzzles and getting the colouring out! I do love a puzzle myself Alister recently got this Minion Puzzle which contains 4 x100 piece puzzles slightly more difficult for Violet but she's definitely getting the hang of it! Hope this have given you some ideas for things to do when the weather isn't that great it can be difficult trying to entertain them for a long period inside over the summer! What do your kids enjoy doing inside?